Melrose supports and monitors the corporate social responsibility policies, practices and initiatives across its businesses. Reflecting the decentralised nature of the Group, responsibilities for the adoption of policies practices and initiatives sits at a divisional unit level. This ensures that rigorous and targeted policies and procedures are implemented that meet local regulatory requirements and guidance whilst also taking into account the size and nature of the business. The information set out on this page focuses on the initiatives taken during 2017. The policies, practices and initiatives set out on this page are indicative of the approach taken with any new business Melrose acquires. As part of the Group’s decentralised approach, each of Melrose’s businesses is responsible for setting and measuring its own employment and employee related KPIs and, as such, these can vary throughout the Group. However, such measurements will generally include absenteeism, punctuality, headcount and employee relations issues. Any concerns or adverse trends are responded to in a timely manner. Equal opportunities for appropriate training, career development and promotion are available to all employees within the Group regardless of any disability, gender, religion, race, nationality, sexual orientation or age. Applications for employment by disabled persons are always fully and fairly considered by the Group and are considered on merit, with regard only to the job-specific requirements and the relevant applicant’s aptitude and ability to carry out the role. Furthermore, as a Group-wide policy and so far as particular disabilities permit, Melrose and each of its businesses will, where practicable, make every effort to provide continued employment in the same role for employees who are disabled during their period of employment or, where necessary, provide such employees with a suitable alternative role, together with appropriate training. It is the Group’s policy that in recruitment, training, career development and promotion, the treatment of disabled persons should, as far as possible, be identical to that of other employees. Melrose is proud to be a member of the Business Disability Forum, a not-for-profit member organisation that works with the business community to understand the changes required in the workplace in order that disabled persons are treated fairly, so that they can contribute to business success, to society and to economic growth. The Group places great importance on good labour relations, employee engagement and employee development. The responsibility for the implementation and management of employment practices rests with local management, in a manner appropriate to each business. A culture of clear communication and employee consultation and engagement is inherent across the Group. Employee briefing sessions with employee representatives are held on a regular basis to communicate strategy, key changes, financial results, achievements and other important issues to employees, and to receive feedback from them on these issues. Regular appraisals, employee surveys, notice boards, team meetings, suggestion boxes and newsletters are also used to communicate and engage with employees, and to solicit their feedback on issues of concern to them. Extensive training is available to all staff and is actively encouraged to ensure that high standards of skills are maintained across the Group. Inter-departmental training programmes are also put in place across the Group to ensure that skills are shared between operations. The importance of training extends beyond on-the-job training and also focuses on enhancing personal development. In addition, apprenticeship programmes help to assist with training a new generation of employees and to ensure knowledge is retained within the businesses. Employees across the Group are encouraged to think innovatively and to have regard for both financial and economic factors affecting the Group. The Group regards employee training and advancement as an essential element of industrial relations. The SST division continued its emphasis on improving its products and services through the employee invention process. Three of 2016’s employee submissions have resulted in the grant of patents, and 2017 saw another 36 submissions, with five resulting in patent applications (including one design patent issued from efforts by SST’s engineering team in Shenzhen). Several submissions have also resulted in new products and product improvements. The Patent Committee meets monthly to review employee submissions, the committee consisting of inside counsel, outside patent counsel, senior engineering leadership from all offices, and the inventors themselves. Incentives are in place for employees to submit, including financial incentives if submission results in applications filed and patents granted. Within our Ergonomics division, Ergotron has conducted over 20 training programmes globally with over 1,700 employees participating. Topics included leadership and management skills training, technical and quality training, product and marketing training, system and process training in addition to wellness and benefits training. Ergotron also has global programmes that provide employees opportunities to enhance their education through educational reimbursement. Brush continues to take the health and well-being of its employees seriously and its Occupational Health Service is available to employees four days a week. The service can make referrals to doctors, physiotherapists or counselling services, as required, ensuring that the business supports its employees throughout any periods of absence or illness. Health promotion is a key feature of the service, which is continually developing through awareness campaigns and has had a positive impact on both the employees and the business as a whole. During 2017, Brush GMS, based in Pittsburgh, promoted employee engagement by supporting employee leisure and community/charitable activities such as summer games, family parties and community outreach activities. It has also increased management training resources. 165 employees attended the first Air Management Leadership Bootcamp in Itasca, Illinois in April 2017. The Leadership Bootcamp reinforced the Air Management mission and values and key business objectives for 2017. Over the three days, leaders actively engaged in seminars to equip them with specific skills and business tools to support a performance driven culture. Outside business experts led employees through topics such as financial management, team dynamics, and plan execution tools. Employees of the Group have supported a number of worthwhile charities during 2017. Here are a few examples of the great contributions that have been made. NSC held a drive to help the victims of Hurricane Maria in Puerto Rico and shipped 13 large boxes filled with items such as canned goods, toiletries and clothes to San Juan, Puerto Rico. NSC also used cash donations to buy supplies of food and collected containers of pet supplies for local animal shelters who were taking in dogs rescued from Puerto Rico. Since 2012, Ergotron has made a commitment to sponsor and participate in the American Heart Association’s (AHA) Heart Walks throughout the US. AHA is an organisation whose mission is to improve the lives of all Americans and help people understand the importance of healthy lifestyle choices, which aligns with the Ergotron mission of promoting a healthy environment for life and work. Teams from the business’s Twin Cities, Phoenix and Tualatin offices have raised over $130,000 and look forward to the fundraising activities and the Heart Walk every year. HVAC was once again named one of the top 40 giving companies in West Tennessee for its commitment to investing in its community. One of the excellent causes HVAC supported was March of Dimes, a US non-profit organisation that works to improve the health of mothers and babies by preventing birth defects, premature birth and infant mortality. Approximately 20 employees participated in the walk, which was held in Dyer County, Tennessee in October 2017 and raised $5,000. On 19 December 2017, HVAC supported a group of local, under-privileged children by donating presents that the children had wished for in their letters to Santa. HVAC employees, along with Santa, attended the surprise Christmas party at their school. Melrose is a meritocracy and individual performance is the key determinant in any appointment, irrespective of ethnicity, gender or other characteristic, trait or orientation. The Board recognises the importance of diversity throughout the workforce and the Board is committed to equality of opportunity for all employees. The Group currently takes into account a variety of factors before determining suitability for vacancies, including relevant skills to perform the role, experience and knowledge. The most important priority, however, has been and will continue to be ensuring that the best candidate is selected. Melrose notes the recommendations of Lord Davies’ review, “Women on Boards” and continues to encourage gender diversity throughout the Group. Although not appropriate to set specific gender diversity targets at Board level and throughout the Group’s workforce due to Melrose’s strategic business model and frequent turnover of businesses, Melrose is actively engaged in finding ways to increase the Group’s diversity. The charts show the total number of males and females working within the Group as at 31 December 2017. The Melrose Board fully understands the importance of the Group’s environmental responsibilities and is committed to ensuring that operations have the minimum possible adverse effect on the environment. Although there are no standardised environmental KPIs currently used within the Group, the Group ensures businesses understand the importance of monitoring the impact of their operations on the environment. A range of KPIs are used as environmental measures, including energy consumption, CO2 emissions, water consumption, water contamination, waste disposal, solid and liquid waste generation, recycling and volatile organic compound emissions. These KPIs are then used to plan for ongoing improvements. During 2017, the Company continued to comply with the ongoing annual reporting requirements of the UK’s Carbon Reduction Commitment Energy Efficiency Scheme. SST continues to make its environmental awareness and compliance one of its highest priorities. The various sites continue to evaluate their operations and strive to make improvements to reduce their environmental global footprint. The manufacturing site located in China completed seven energy and emissions reduction projects, as well as adding exhaust filtration and tin slag recovery systems. Continued improvements in cardboard, pallets, paper and universal waste systems have been implemented throughout the continental US. SST’s Chinese site’s efforts resulted in a 4% reduction in electrical consumption and a 2% drop in paper consumption. Continued improvements are planned for 2018 including the review and reduction of the hazardous material quantities/hazard level as directed by ISO 14001 standard, improving and increasing waste recycling systems, and reducing their carbon footprint. Ergotron maintained the environmental certification ISO 14001:2004 in its locations in Eagan, Minnesota, EMEA, and Asia Pacific and added ISO 14001:2015 in Asia Pacific. The division focused throughout the year on reducing its impact on the environment, resulting in 95% of waste materials at its EMEA, Eagan and Minnesota locations being recycled. The Asia Pacific sites have decreased the loss of main raw material (scrap rate 0.2% maximum) and decreased the electricity wasted by 3% compared with 2016. The Air Management division rolled out an environmental inspection process at facility level which will be audited in early 2018. In 2017, the Air Management division worked closely with insurers to successfully address employee related inspection items with 22 items being addressed. Brush continued its focus on making further energy savings, including in gas and electricity consumption. Through more effective energy management and greater employee engagement, electricity consumption for lighting at its Czech operations was reduced by 5%, whilst heating consumption was the lowest in the location’s history again. Lighting initiatives across the Loughborough site continue with ad hoc upgrades which continue to generate savings for the business. The Loughborough site is also working towards environmental management standard ISO 14001:2015 transition. The site is also in the process of replacing existing lighting with LED luminaires which will deliver an annual reduction of 83.5 tonnes of CO2 and 35.04kw reduction of light load. The Group is required to measure and report its direct and indirect greenhouse gas (GHG) emissions pursuant to the Companies Act 2006 (Strategic Report and Directors’ Reports) Regulations 2013. The emissions associated with the purchase of the Nortek Group in 2016 were included in the report for the first time in 2017 and account for the significant year-on-year increase in emissions. However, the intensity measure decreased by over 60% year on year. 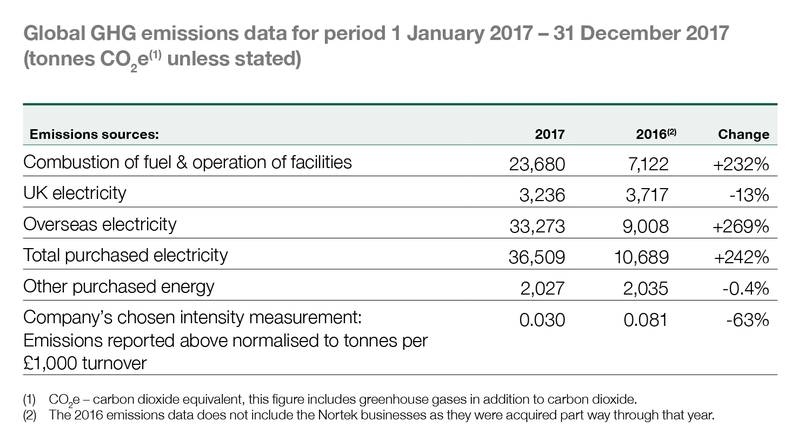 The year-on-year like-for-like emissions, removing the Nortek group emissions, decreased by approximately 20% due to a significant reduction in gas and electricity usage. The GHG reporting period is aligned to the Company’s financial reporting year. The data has been prepared in accordance with the principles and requirements of the Greenhouse Gas Protocol, Corporate Accounting and Reporting Standard (Revised Edition) 2004 for Scope 1 and Scope 2 emissions and the Department for Environment, Food & Rural Affairs (DEFRA) guidance on how to measure and report on greenhouse gas emissions, as first published in 2013 and subsequently updated. We have reported on all emission sources required under the Companies Act 2006 (Strategic Report and Directors’ Reports) Regulations 2013. All material emissions from within the organisational and operational scope and boundaries of the Group are reported. The emissions from owned vehicle transport (i.e. Group owned cars and vans, lorries and fork lift trucks) and the emissions associated with refrigeration have been excluded from the report on a de minimis basis. Given that the Melrose business model is to acquire and divest businesses over a three to five-year time frame, there may be significant year-on-year changes in the reported emissions data which may not reflect the underlying GHG performance of the Group’s businesses. The Board is committed to minimising the health and safety risks that each Group employee is exposed to by promoting the effective use and management of business-specific policies and procedures. The Group has a policy to ensure that the Directors are made aware of any serious health and safety incidents, wherever they occur in the world, without delay, to ensure that suitable investigations and corrective action can be organised. Current events and issues relating to health and safety matters are also discussed within the Group at quarterly Board meetings of the Company. Each division is responsible for setting its own detailed arrangements concerning health and safety policies and procedures, in accordance with local health and safety legislation. As a general rule, they strive to achieve best practice in terms of what is suitable and practical for the size and nature of their operations. Defined and business-specific health and safety key performance indicators are also used. Reports detailing each division’s performance in relation to three health and safety KPIs (major accident frequency rate, accident frequency rate and accident severity rate) are presented to the Melrose Board and reviewed at each quarterly Board meeting. There were no material issues or concerns identified by the Board during 2017. While no corrective measures were deemed necessary, the Board continues to encourage management to remain vigilant where employee and third party safety is concerned. A number of sites within the Group hold the ISO 18001 certification, the internationally recognised assessment standard for occupational health and safety management systems, including Brush’s manufacturing locations in the UK and the Czech Republic and Ergotron’s Asia Pacific sites. GBIS Huizhou China is also ISO 14001 registered. HVAC rolled out their Safety Council early in 2017. The team worked on facility communication across all locations, harmonising policies, and developing or sharing best practices. As a result of these actions, they had great success in reducing the recordable injury rate by 16% over the year. During 2018 HVAC, along with all of Air Management, will engage with DEKRA to further develop a safety driven culture. All locations will be evaluated to determine the level of understanding and status of leadership involvement. These evaluations will lead to future tasks and plans to grow awareness and develop a safety driven culture. Brush’s behavioural safety programme is designed to improve the strong health and safety culture within the business. The programme focuses on developing a proactive approach among Brush employees so that they increase responsibility and accountability for their own and their working group’s actions while ensuring they intervene at the earliest opportunity to stop hazardous acts or correct any unsafe conditions. It is intended to refresh the behavioural safety programme during 2018. At Brush Electrical Machines in Loughborough there has been increased focus on accident prevention by issuing Safety Alerts, implementing management “walk-abouts” to hazard “hot-spots” and improved, more efficient reporting and closing of incidents. The result was a significant decrease in the number of lost days in 2017. Following these initiatives, among others, the Group has recognised the benefits of a workforce engaged in matters of health and safety, management teams committed to the continuous improvement of health and safety standards throughout the Group’s businesses and a recognition that a strong health and safety focus can have a positive impact on growth and brand value. Each of the businesses is responsible for the management of its supplier base, including the application of the appropriate policy, which best suits the geographical and operational diversity of the Group. The security, assurance and ethical compliance of business supply chains are very important to Melrose and its businesses. Responsibility for the implementation and management of all supplier-related policies rests with local management. Such policies are used in a manner appropriate to the size and complexity of the business and also take into account the nature and geographical representation of key suppliers. A supplier approval process exists within all business divisions, which is linked to specific and tailored supplier assessments and due diligence requirements utilising third party resources and the implementation of appropriate terms and conditions for the protection of the Group. Sound business ethics and integrity are core to the Group’s values and a high importance is placed on dealings with all employees, customers, suppliers and other stakeholders. The decentralised nature of the Group means there is no over-arching policy currently in place with regard to human rights, however Melrose is committed to good practice in respect of human rights. Employees across the Group are required, at all times, to exhibit the highest levels of integrity and to maintain the highest ethical standards in business affairs. The full text of the Melrose Code of Ethics, which all employees of the Group are required to familiarise themselves with, can be found on the Company’s website. In addition to the Melrose Code of Ethics, each Group business is expected to have its own code of ethics dealing with matters such as human rights. All business-specific employee policies are prepared locally within each business in order to ensure compliance with local laws and standards as a minimum. Responsibility for the communication and implementation of such policies rests with the relevant senior managers within the Group’s businesses. Finally, the Company produced its first Modern Slavery Statement in June 2017 in accordance with the Modern Slavery Act 2015 which is available here. The Group has taken steps to implement effective and proportionate procedures to ensure that there are no forms of modern slavery in the Group’s business or supply chains. This has included the roll out of a new policy regarding the prevention of modern slavery and human trafficking to all businesses and online training for employees.